Corvus’ batteries are currently in use in a variety of vessels. 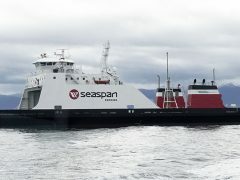 Even industry leaders like Canada-based Corvus Energy Inc. (Corvus) say we are many years away from all-electric, battery powered, deep sea ocean going vessels, but in the meantime, battery technology could play a significant role in helping operators with the increasingly important issue of at-berth emissions regulation compliance, the marine battery manufacturer has told Ship & Bunker. “People are starting to talk about it now, specifically using battery power to deal with at-berth emissions,” Sean Puchalski, VP Strategic Marketing and Accounts, told Ship & Bunker. The reason for this becomes clear when the current costs and power considerations are seen in detail. “Once the cost of not only the battery, but all the other gear – power conversion, energy management system, electrical distribution systems and so on – are taken into account, at the moment the cost is around $750,000 to $1 million per megawatt hour,” says Puchalski. As a sign of how much progress is being made in this area though, this cost is significantly less than the $7 million to $9 million it would have cost just two years ago. In terms of size, Puchalski says current density allows for 3 megawatt hours in a standard 40-foot container. Taking all this into account, right now he says the “biggest bang for your buck” is for short routes, and hybrid operating vessels, with the technology particularly attractive for offshore markets and ferries. “Offshore vessels, tugs, and short haul ferries have a highly variable load profile, average power is typically much less than total generator capacity,” says Puchalski. But the suitability for at-berth regulation compliance is equally clear, with the issue coming under increasing scrutiny in recent times. This has been particularly so for the cruise sector, which over the last year alone has been subject to public concern over the matter in Australia, the UK, Spain, and the US. And at-berth emissions regulations are tightening; in addition to general emissions control area (ECA) regulations in Europe and North America, since January 2014 California has had rules in place mandating the use of at-berth shore power, while in Asia, over the last year Hong Kong and Shanghai / the Yangtze River Delta have introduced at-berth bunker rules. Even outside of the regulations, some operators not even in the general public’s eye are making voluntary at-berth emissions reductions. Wallenius Wilhelmsen Logistics (WWL) are a case in point, who last month launched a new policy that requires all of its vessels to burn bunkers with a less than 0.1 percent sulfur content, or an equivalent method of compliance, while at berth in any port around the world. With technology such as Becker Marine Systems‘ (Becker Marine) liquefied natural gas (LNG)-powered cold ironing barge (Hummel) also already in service, and looking at how far the industry has come in its emissions regulations over the last decade, it is not inconceivable that in the next 10 years we will see requirements for zero emission port calls. Marine battery technology can clearly play a pivotal role in making such a scenario a reality.